AK: In your recently published book Surviving Poverty: Creating Sustainable Ties among the Poor, you interview people who are experiencing severe poverty. For some of them, a major factor in the difficulties they experience is not having family ties at all, or not having family members who are willing to help them. Some of your interviewees went on to form long term family-like ties with others that you call “sustainable ties” after joining a poor people’s organization that helped them form those ties. What do your findings tell us about the importance of family ties or other “sustainable ties” and their connection to falling into and getting out of poverty? JMM: Ties with others are incredibly important for those struggling financially. Social ties may not help people escape poverty, but they can help them cope with its worst consequences. One of the most vital ways social ties protect people is helping them to avoid homelessness. For people who live from one paycheck to the next, a missed paycheck due to an illness or other crisis can lead to eviction. But people in this situation might avoid homelessness if family members can loan them money for rent. And if no one can help with money, family members might provide a place to stay temporarily, allowing them to avoid living on the street. Many of my research participants who didn’t have family to rely on had experienced homelessness. Sometimes family ties aren’t as positive as we wish they would be. One participant, Rosa, told me about the time she asked to shower at a cousin’s house; the cousin wanted to charge her and her daughter money for the water they used. Alyssa lived for a time with family members but had to turn over much of her wages to them to do so. But social ties with people who aren’t family can easily dissolve, especially given the pressure that extreme poverty places on them. Many participants described how this had happened in the past when they relied on non-kin ties. Sustainable ties are ties between people who aren’t family, but last for a long time. In my research, I found that the Kensington Welfare Rights Union (KWRU), which brought poor people together in the fight to survive, fostered such sustainable ties between members. Some of these ties have lasted for decades. KWRU provided housing for members who needed it, and thus filled a void for those who didn’t have family to rely on. As Pauline told me, “when my family didn’t give me nowhere to stay [KWRU] did, and I need somewhere to sleep for my kids. . . . When I came here they treated me like a family, like I was part of their little family.” Sustainable ties people built through KWRU made an enormous difference in members’ lives. AK: What are some of the differences you found between poor people who were able to build “sustainable ties” through the organization you studied, and poor people who weren’t members of that organization? JMM: One of the main differences is that those in the organization felt less alone. They had a real sense of community. They also felt enveloped by social support, because they weren’t relying on just one tie. Most of those who weren’t in the organization did have family to rely on, but usually just one or two kin ties. Often those kin ties created a lot of negative feelings, in which family members helped only grudgingly, or the help came with guilt, shame, and strings attached. People usually turned to KWRU when they were desperate, and therefore the people I interviewed who weren’t members of KWRU were generally a little bit better off—almost all of them had lived with family members as adults and many received other kinds of support from family, like free child care for their kids while they went to work or school. AK: When doing the research for this book, what important lessons did you learn about addressing poverty and building “sustainable ties” that may be useful for other poor people’s organizations, policy makers, or the average person going through tough financial times? JMM: One of the key lessons is the importance of reciprocity in building ties that last. Giving back—helping other members, volunteering in the office, and attending rallies—functioned like monetary dues in KWRU. This increased the number of people KWRU could help. It also made members feel better about getting help and helped to foster a sense of community. Organizations that serve poor people could ask them to do small things to invest in additional help and build ties with other clients based on this model. Policy makers must understand, however, that fundamental needs have to be addressed first. Social ties can do a lot, but they can’t do everything. We need more income supports, child care subsidies, and widely accessible affordable housing. While KWRU members did build sustainable ties with minimal governmental support, their feelings about mutual support outside of KWRU as well as the experiences of those I interviewed who weren’t members of KWRU suggest that desperate poverty makes it very difficult to rely on one another. Positive social policies addressing fundamental needs would take the pressure off; people could be there for each other without worrying about being completely drained. In terms of what the average person going through tough financial times can do, it’s so easy and common to want to withdraw from other people when you’re struggling financially. People feel embarrassed; they blame themselves, even when larger forces are at work, like a high unemployment rate. I found many participants in my study had done this, and it increased their desperation and depression. So to people going through tough times, I would say, remember that you’re not alone. And everyone needs help sometimes. Don’t be afraid to look for the right community and reach out to it. Joan Maya Mazelis is Associate Professor of Sociology and an affiliated scholar at the Center for Urban Research and Education at Rutgers University-Camden. 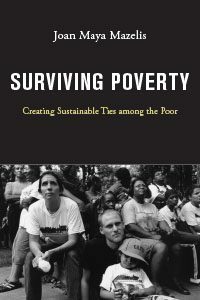 Her book, Surviving Poverty: Creating Sustainable Ties among the Poor, is available from NYU Press. Follow her on Twitter @JoanieMazelis. Arielle Kuperberg is an Associate Professor of Sociology at the University of North Carolina at Greensboro. Follow her on twitter at @ATKuperberg. this is one book going on to my reading list. From reading other articles I can understand how behaviors, like being unsupportive, can be passed from generation to generation. It is still sad to read that there are families who would charge their own kin to use something like a shower. I think that it is very important that people have their fundamental needs met, people should not have to feel embarrassed or blame themselves for going through a financial strain. This is such an interesting piece on the importance of social ties. I can see how without these specific ties, and social and community support, coming back from the setbacks of poverty are incredibly difficult. Without family support, the support of both social programs, other families, and community members, is critical. Together we can create communities that support our most vulnerable.